I was watching the Disney movie The Little Mermaid recently and then a few days later just happened on a quilt block called Mermaid's Hair. This seemed to be a sign that I should make a pattern for this quilt block. Naturally, I incorporated Ariel's hair and fin colours as part of my colour scheme. 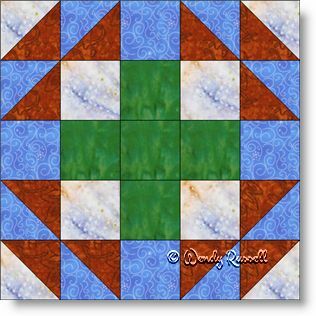 This five patch block is a good learning experience to practice your half square triangles. The only other basic shape used is the square, so the construction is pretty simple. I chose to construct the block as an uneven nine patch as I think it is easier to sew than using five rows of five, but you may opt for sewing in rows as your chosen method, and that is fine as well. The sample quilts illustrated use the two basic layouts for quilts -- the straight set with blocks side by side and the on point setting with additional plain blocks to make a larger quilt and also to showcase your quilting skills.